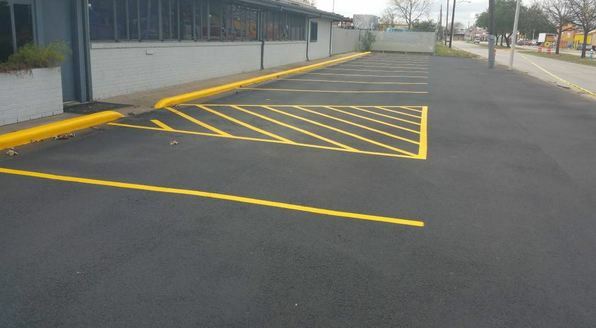 Looking for help with parking lot or driveway paving or sealcoating? Maybe resurfacing or pothole repair is more of what you’re looking for? Require service in Sterling, Virginia? Call (703) 810-7630 and get you free project estimate TODAY! What Are The Costs For Driveway Paving Using Asphalt? You are redoing your driveway in Sterling, Virginia, and you are certainly wondering what the costs will be. Which do you think looks better: Asphalt or Concrete? Homeowners have different opinions on the subject. Let’s just say that asphalt is cheaper, by $2 a square foot on average. Typically, driveway paving with asphalt is going to run you $4 a square foot, while concrete is going to run you $6 a square foot. If you know the square footage of your driveway, then you can do the math to figure out how much you might expect to pay. People’s driveways are different sizes, but on average, homeowners pay about $4400 dollars. As for a range, cost averages are anywhere from around $2800 to $6200. The price averages quoted to you are for asphalt services, not concrete paving. If you have a smaller driveway, costs can be as low as $1500. Yet they can also run as high as $10k, and even more, if you are talking one of those driveways that are basically roads. It was mentioned that asphalt costs about $4 a square foot, but on the low end, it can cost you about $3 a square foot. Keep that in mind as you speak with contractors about repaving your driveway. it would be nice to save a little money, but you want quality work done as well. Is driveway sealing and seal coating going to cost you extra? You are certainly going to want to factor in all the costs as you are budgeting this project. Asphalt is a great choice, and it is certainly cheaper. Talk with a contractor you can trust in your area, and get that quote. Hopefully you are quoted a price on the low end of the range of numbers given, and you can schedule this project under budget.